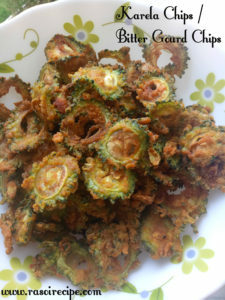 Today’s recipe is ‘Karela Chips’. 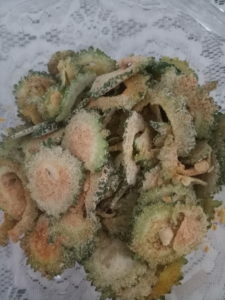 Crunchy and crispy chips recipe of bitter gourd. We popularly call it karela here in India.It is a recipe of chips which even diabetic person can enjoy without worrying about health. 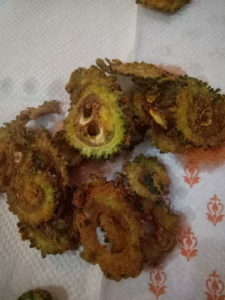 Monsoon is one season, where you can enjoy every type of fried snack. You can even store this chips in an air-tight container just like your potato chips/wafers. It is tastes slightly bitter and tangy both. 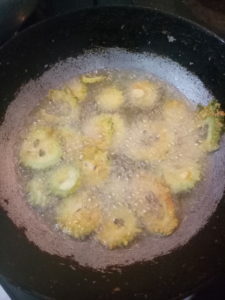 For this recipe, you will need karela (bitter gourd), gram flour, rice flour, corn flour, few spices and lemon juice. To get crispy and crunchy chips you need to fry chips on medium-low flame. Corn flour and rice flour are other reason behind the crunch of chips. You can also try Purple Yam Chips Recipe (Ratalu/Kand Fries) , only time which these chips recipes require is for frying on low-medium flame. Lemon juice 1 tsp or juice of 1 small lemon. 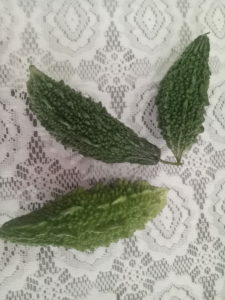 Wash and let the bitter gourd / karela air dry. In a mixing bowl, add karela slices, all the dry ingredients and lemon juice. 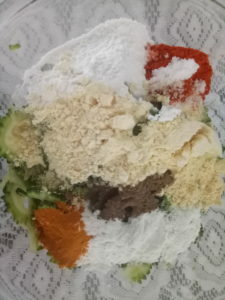 Mix well, till all the slices are coated nicely. Heat oil in a deep pan or wok or kadhai. Now start frying chips in batches on low-medium flame. Serve it immediately or store in an air-tight container. 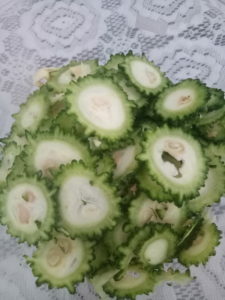 Cut slices carefully, if there are large seeds inside bitter gourd, please remove them first. Frying on low-medium flame is the key to get cruncy and crispy fried snack. You can also sprinkle chaat masala on the chips. If your coating is too dry, sprinkle very small amount of water on the slices. 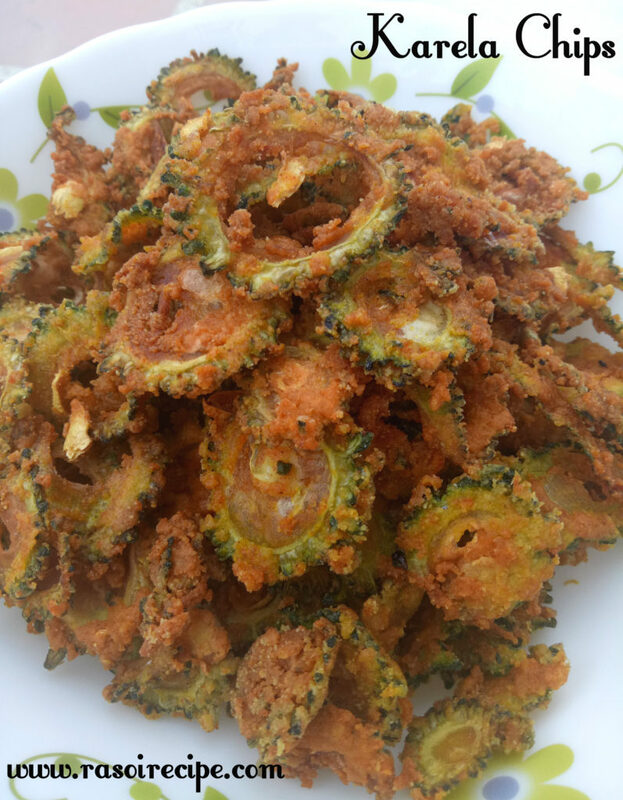 And trust me, this is the best way to introduce karela in your diet. ? Trust me it was soooo crunchy and crispy, we finished it in one go. ?